When I have a cough, I reach for a cough drop or lozenge to help me feel a bit more human and less like a growly ogre. I have a few favourites depending on what types of symptoms I’m experiencing. There is a huge variety of cough drops on the market. In this article, I’ll discuss cough drop ingredients and different varieties, and then I’ll make some recommendations based on the best selling brands of cough drops. Feel free to go right to the items by clicking the links in the table below to see the latest prices and reviews on Amazon. These are some of the best selling cough drops available. Many of these can be found in different sized bags, so I’ve tried to link to the size that offers the best value. This Swiss brand has been around since 1930. Perhaps you recall the iconic 1990’s commercial of the horn blowers in the Swiss Alps calling “Riiiii-cooo-laaaaa.” That commercial seared the brand into the minds of multiple generations, I’m sure. But it helps that the product advertised is a good one. Ricola bills itself as a “natural herbal” cough drop, containing menthol as the active ingredient and a special herb mixture, along with starch syrup, colouring, “natural flavors,” and sugar. These come in a resealable package with 130 individually wrapped drops. Ricola makes other flavors, too, as well as sugar-free varieties that are sweetened with aspartame. The flavor is certainly a distinctive one, and I happen to love it, as do many others. This seems to be a brand with loyalty—many people will only buy Ricola. Some reviewers note that these seem to be more gentle to use than other brands with a more prominent minty/menthol flavor. One complaint mentions that the use of mint, however, can be irritating if taken over a recurring time period. Most cough drops are meant to be taken for a limited time, so you shouldn’t be reaching for thee on a regular basis; only when you’re dealing with a nasty cough. Hall’s is another well-known cough drop brand. They offer a wide variety of flavors and types. This honey-lemon version seems to be one of the favourites. 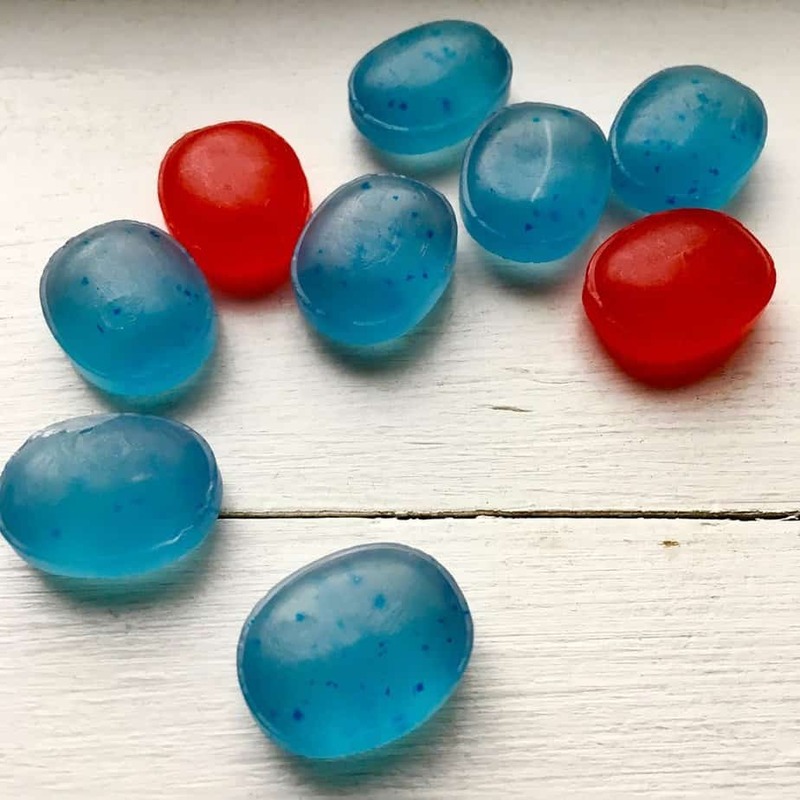 These drops contain menthol as the active ingredient and also contain beta carotene, eucalyptus oil, “flavor,” isomalt (a sugar substitute), soy lecithin, sucralose, and water. So it’s not the most natural option, and the “honey lemon” is really just a flavoring. These come in a resealable bag of 180 and are individually wrapped. Many people like these drops. For anyone who has to avoid sugar, this is a reasonable option. Many users find these very effective at soothing sore throats and opening up congested airways. Some people find they actually cut down on the duration of their colds. But some buyers mention that these do have that artificially sweetened taste, and others find that these taste overly “medicinal.” Another negative some reviewers note is that these don’t last as long as some other drops do. doTerra is an essential oil company. 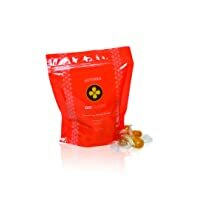 These cough drops are sweetened with organic evaporated cane juice and organic brown rice syrup, and the contain wild orange essential oil (eo), clove eo, cinnamon bark eo, eucalyptus eo, rosemary eo, and myrrh eo to provide the cough relief. The bag contains 30 individually wrapped cough drops. The lack of menthol gives these a very different taste than many other cough drops. It’s a good option for anyone who finds menthol irritating or harsh. They do feel “spicy” on the tongue, due to the clove and cinnamon oils, and this is the flavor that comes through the most. Many people swear by these cough drops. They like that the sweeteners are organic and find the essential oil blend to be very effective at relieving a sore throat. Singers and people who do a lot of public speaking really like these drops as they provide relief without irritating the vocal chords as menthol-based cough drops can do. The biggest complaint with these is the flavor, which some people really just don’t like. The other complaint is that these are definitely more expensive than most big-name brands such as Hall’s or Ricola. Luden’s is another fairly well-known brand of cough drops. This cherry flavor is a classic, and there are 90 individually wrapped candies in this resealable bag. The active ingredient in these drops is pectin, a demulcent, which acts a soother without some of the harsh mucus-moving effects of menthol. The inactive ingredients are ascorbic acid, citric acid, corn syrup, colourings, flavors, magic acid, sodium acetate, sodium choloride, soybean oil, sucrose, water. People who dislike menthol really appreciate these drops to provide relief of sore throats and mouths. Many people also really love the flavor of these and tend to eat them like candy! The main complaint is that these contain a lot of artificial ingredients and questionable sweeteners such as corn syrup. Some people do find these too sweet to taste. Cepacol makes a number of varieties of throat lozenges. They typically come boxed with those plastic sheets and the punch through foil backing. As such, they just appear more like medicine to me than typical cough drops. These are the lozenges we stock when it’s cold season, for the really bad coughs. As they contain benzocaine and menthol, they have a bold numbing effect that is helpful for relieving really painful sore throats and the after effects of hacking coughs. They are also useful for canker sores and other sources of mouth pain. The inactive ingredients are colourings, flavors, isomalt, maltitol, propylene glycol, purified water, sodium bicarbonate, and sucralose. Many people agree that these are great for especially painful sore throats. Some people even comment that they used these after mouth surgery. The numbing effect is very strong, and they are great for nighttime relief of persistent coughs (my primary use!). Some find the taste is overly medicinal. Others don’t like how strong the numbing sensation is. These also contain a number of artificial ingredients and sweeteners, so they’re best to take only when you find you really need that level of relief. People usually take cough drops to ease a sore throat or to suppress a cough. You may also get an immune system boost from your cough drop to help your body fight the infection that’s causing the cough in the first place! If you’re experiencing pain, then you probably want a cough drop with some numbing agents in it, like menthol, eucalyptus or benzocaine. These ingredients are also expectorants, which help your body with the natural process of, well, hacking up phlegm to get rid of the infection. These types of drops can, however, be irritating, so you shouldn’t take them for more than a few days. Non-menthol ingredients for soothing a sore throat include pectin and honey. These are good alternatives if you find menthol and its minty counterparts too irritating. If you’re experiencing a persistent and painful cough, you may want a cough drop with ingredients to help suppress the cough (called antitussives). Menthol is a common cough suppressant. Given that menthol is both a suppressant and a pain relief ingredient, it’s found in many cough drops. Your cough drops may also be able to help clear up the infection itself. Ingredients like zinc, Vitamin C, honey, ginger, and echinacea may help your body heal faster. Herb blends and essential oil blends are also said to assist in fighting the underlying infection. The science isn’t totally conclusive on the effectiveness of these different types of ingredients, but they are pretty benign in small quantities so it’s worth a try! Now that you’ve determined the reason for taking a cough drop, you can get further into the different options. Cough drops come in a huge range of flavors. Lemon and honey-lemon are one of the most popular, and these may also offer the infection-fighting benefits of Vitamin C and honey. Cherry is another popular flavor that may give you a boost from antioxidants. Other common flavors include mint/menthol, orange, green tea, and herby sorts of flavors that are unique to the drop brand. Mostly, choosing a flavor is a matter of personal choice, but certain flavours may offer different benefits from others. Many cough drops are basically glorified candy, containing lots of sugar or often even corn syrup. There are many sugar-free varieties (particularly important if you’re diabetic, for example), but there may be some drawbacks to artificial sweeteners, so consider that choice carefully. Artificial flavors are common as well. So look carefully—don’t assume the “lemon” cough drop will give you a boost of Vitamin C because it may not contain any lemon at all. Most cough drops come in a bag or sleeve with individual wrappers. This is useful if you want to take them on the go in a purse or school bag. It’s also nice when the bags reseal to maintain the freshness of the drops. Painful and persistent coughs are such a drag. Luckily, there are a number of cough drops to soothe your sore throat or nagging cough. If you’re experiencing a sore throat from an infection like strep or a wet cough from a cold, the classic Ricola is a great option. It’s effective and contains natural ingredients unlike many other cough drops. If your cough is on the dry side and you want to avoid menthol, doTerra is worth a try, although it’s definitely a pricey option. 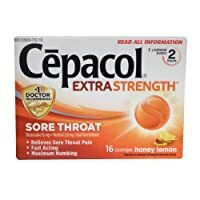 For relief of very harsh, painful coughs, I recommend Cepacol. The addition of benzocaine takes these to a different level of pain relief. But given the many artificial flavors in these, I recommend only reaching for them when the cough and pain are extreme, and for relief at night so you can sleep! I personally try to avoid cough drops with artificial sweeteners. But if you cannot have sugar, Hall’s Sugar-free Honey Lemon drops seem to be an effective option. What’s your go-to cough drop? Share in the comments! The Best Cast Iron Wok — and It Won’t Break the Bank!